Concealed carry is legal in multiple states. If you want to conceal carry your Glock 19, you can choose from a large array of holsters. In the following article, we present 7 of the best Glock 19 holster models, and we explain their pros and cons. Further, in the article, we list some of the features that make holsters good or bad. Keep in mind that a good holster is not one you can easily conceal, it’s one that allows you to draw your Glock quickly and safely. Assuming that you already have a tactical CCW belt, so you should just choose a holster you can wear comfortably for a long time. Fits Glock : 19 G19 9mm / Glock 23 G23 .40 / Glock 32 G32 .357 / Glock 38 G38 .45GAP. If you’re looking for a comfortable inside the waistband holster, you should take a closer look at the KT224B model produced by Galco. This holster is made out of 100% leather, and it fits belts up to 1 3/4” wide. The holster’s backing plate is made out of saddle leather, and the front out of Napa leather. 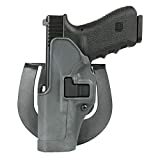 The Kydex holster pocket will make drawing and holstering easy, and the metal belt clips can be arranged to match the belt’s holes. The BLACKHAWK! Serpa has been specially designed for concealed carry use. 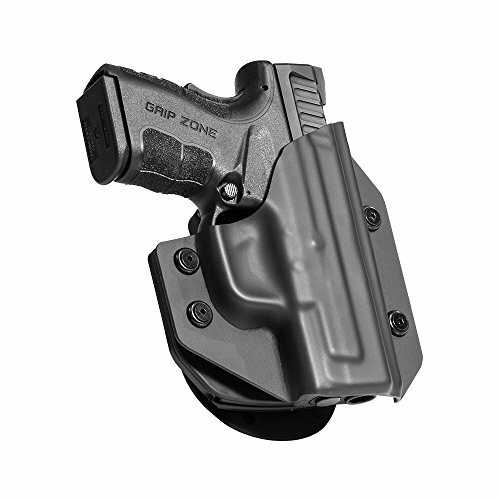 This holster is made out of high-quality polymer, and it has a paddle mount attachment system. The holster uses an adjustable tension system. This holster has a solid build. If you fit it properly on the belt, it won’t move an inch while you’re moving. The adjustable pegs can be fitted to the bottom of your belt, improving the holster’s stability. Audible Click – The holster’s retention system produces an audible click when you holster the pistol. This is a good way to make sure the handgun is safely holstered. Instructions Could Be Clearer – The holster comes with instructions on how to set it up, but they’re difficult to follow. You might be better off watching the video tutorials on Youtube. 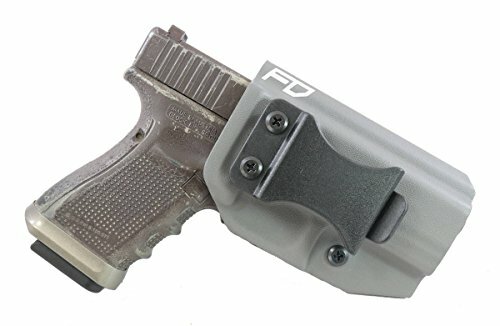 The Fierce Defender IWB holster is made out of 0.8” Kydex. Kydex is a thermoplastic that’s more durable and stronger than other polymers. The Kydex is specifically molded to fit a Glock, and it will cover both the trigger and the back side of the gun. The holster is comfortable, and it will allow you to draw and holster your pistol quickly and safely. The Kydex is quite thick, so you will be able to use the holster for a very long time. Can Scratch Your Gun – This holster can scratch your Glock’s finish, so you have to be extra careful when you’re using it. The Alien Gear waistband holster has an open-mouth design that will allow you to draw and holster your pistol quickly. 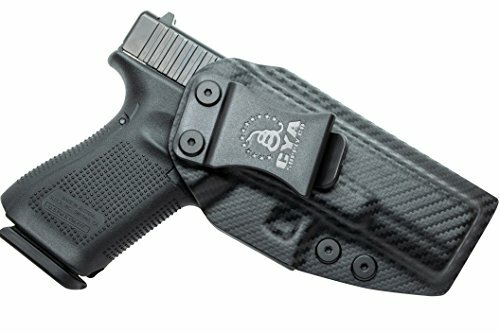 This holster can be worn both as belt-slide or as a paddle. The holster uses a spring steel flexplate to add more retention to your weapon. The holster’s top surface is made out of a high-drag elastomer, so it will hold the pistol without marring or scratching its surface. The flex plate is placed within the holster’s layers, so it won’t scratch your pistol when it increases the retention force. Good Tension – The holster provides a good tension, so it will keep your pistol safe and steady when you use it. If you’re looking for a holster that’s not only functional but also looks great, you should check out this inside the waistline model. This model is handcrafted out of genuine leather, and it’s hand dyed to keep the leather’s natural characteristics. The holster is cured and hardened, and it will maintain its shape for a very long time. The leather will maintain a good hold on your Glock, but it won’t affect its surface or finish. Sharp Clip – The holster’s attaching clip has sharp edges that might poke holes in your clothes. Make sure you smooth the edges before wearing it. If you want to buy a highly durable pistol holster for your Glock, you have to take a closer look at this model. The holster is made out of Boltaron, a high-impact resistant material. The Boltaron is a thermoplastic alloy that has outstanding physical properties, so it will keep your pistol safe at all times. 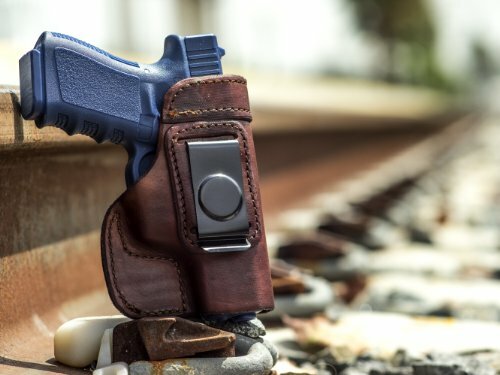 The holster uses a Posi-click retention lock system that will produce an audible click every time you holster your Glock. 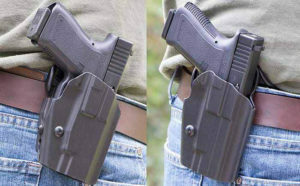 A sweat guard covers the whole length of the holster, so you won’t scratch its finish no matter how often you wear it. Edges Can Be Sharp – The holster’s edges can be sharp. They won’t cut holes in your clothing, but they’re not very comfortable either. The inside the waistband holster produced by Relentless Tactical is made out of bull hide leather. This holster is sturdy and durable, and it will fit your Glock 19 perfectly. The holster is made out of leather, so it will need some broken into before it will fit your Glock perfectly. After the leather stretches for a bit, it will keep a firm hold on your pistol, making drawing and holstering easy and comfortable. The leather has a fine quality, and the stitching is very clean. The holster’s belt clip is made out of sturdy steel, and it will keep the holster in place while you move. Bulky – This holster can be a little bulky, so you might want to wear loose clothes when you’re carrying it. If you’re looking for the best concealed carry holster for your Glock 19, you have to know what differentiates the good from the bad. There are a lot of different models available on the market today, but not all of them are good for concealed carry. Here’s a list of features you should take into account before buying a model. 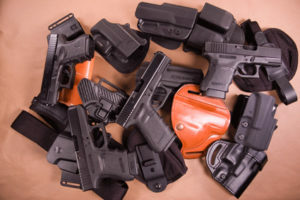 The material used for the holster construction is very important because it will influence how comfortable you’ll be wearing the holster, and it will also influence how well it keeps the pistol stable while you move. There are a lot of different materials used, each with certain advantages and disadvantages of its own. – Leather is still one of the go-to materials for holster manufacturers. Leather is still popular because it has a high-quality, it’s durable, and it’s also comfortable. One of the main advantages of leather is its ability to stretch, fitting your pistol like a glove. The type of leather is also very important. Most manufacturers use thicker leather for the plate and a thinner one for the body. 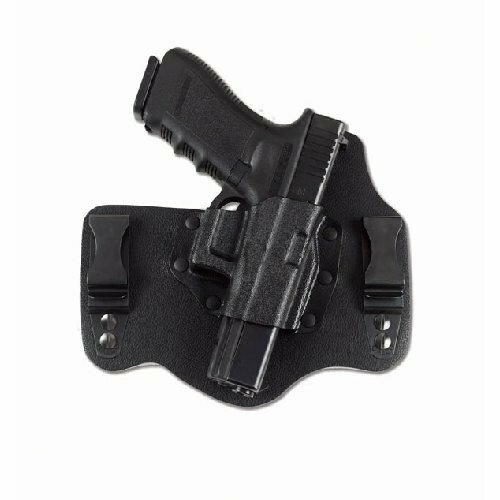 The plate is the part of the holster that comes in contact with your body, so the thicker layer will protect the holster against deforming under your weight. One of the downsides of choosing leather is that it can have sharp edges. If this happens, leather is more difficult to adjust than other materials. – Polymers are used for holsters, and they can be very useful. Some polymers are very tough, so they can be molded into a very durable holster. Polymer holsters are usually lightweight, and they are specially tailored to fit one type of pistol. The main advantage of a polymer holster is its resistance and durability. Some of them also have safety features that make drawing and holstering easier and safer. However, these holsters also have disadvantages. Some of them can have rough edges that might poke you when you’re sitting down. Others might have a rough surface that might scratch your pistol when you’re holstering or drawing it. The type of holster influences how quickly you can reach your pistol, and how comfortable you can wear it for a long time. – The paddle holster design is one of the most popular these days, and it’s easy to understand why. These holsters are easy to attach and detach from your waist, and they can be adjusted quickly. If the holster is poking you while you’re sitting, you can simply slide it forward or backward to find a better position. This type of holster usually comes with an extra safety, so it will hold your pistol nice and secure. There is a disadvantage of using this type of holster. Your pistol will stay slightly further from your body, so it will be more difficult to conceal. However, this is an advantage when you’re sitting down because the pistol’s handle won’t poke your ribs. – The belt loop holster has a similar design with the paddle one, but instead of clipping directly to your waistline, it attaches to your belt. The main advantage of this type of holster is that it keeps the pistol snug to your body., so it’s easy to conceal. The main disadvantage is that it’s not very comfortable when you’re sitting. 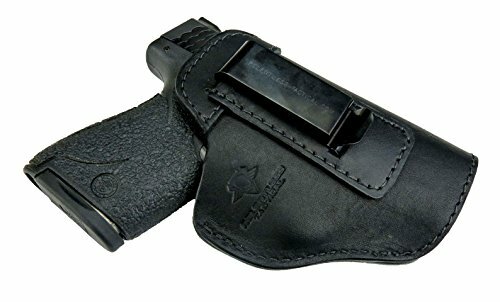 The main advantage of this type of holster is that it will keep the outline of the pistol concealed, so you will be able to wear a simple T-shirt without anyone noticing you’re carrying. The main disadvantage is that these holsters might be slightly uncomfortable when you’re sitting down. They are also more difficult to adjust quickly since they’re placed inside your waistline. It’s very important for a holster to keep your pistol safe and still while you’re moving. There are several ways in which the holster can achieve that. – This is the type of weapon retention you’ll encounter when using a leather holster, but it can also be encountered in several polymer models. The leather holster is usually tighter than it needs to be, and it’s slowly stretched to fit your pistol exactly. This is a great way to make sure the handgun won’t slip when you flex or when you’re sitting down. Some polymer models are molded to fit a Glock 19 exactly, so the pistol will fit in snugly. This will keep it in place while you move. – This type of retention is encountered in some polymer holsters. Instead of relying on their size alone to keep your pistol in place, these models use special fabrics and materials to make sure your gun won’t slip. – This is the best retention system, and it can be found in both leather and polymer models. This system uses a spring to keep your gun in place when you holster it. The spring is activated with an audible click, so you can make sure the pistol is safely secured. As you could see from our short reviews, pistol holsters have different prices. You might be wondering if the price is a certain indicator of quality. Unfortunately, it isn’t. While it’s mostly true that expensive models come with additional features, some of them are not as efficient as cheaper ones. It’s very important to find a holster that will allow you to draw quickly. There’s no use of carrying a pistol if you’re not able to draw it in time. Make sure you practice with an unloaded gun for several days before you start wearing a new holster. Holsters have different sizes, even if they’re designed to fit the same pistol, so your draw can change a little. Always make sure you order a holster specially designed for your drawing hand. Finding the best Glock 19 holster isn’t about finding the coolest or the most expensive one. You should find a model you will be able to wear comfortably for long periods of time, and one that won’t bruise your ribs when you’re driving or sitting down. Concealed carry holsters are very efficient at hiding your pistol under a blouse, but some of them are not exactly comfortable. Also, we recommend you have a look at our buying guide for an ankle holster or shoulder holster for your 1911 series.